The gap wedge fills the gap between the pitching and sand wedges. The gap wedge is a golf club that is used for distances too short for a pitching wedge and too long for a sand wedge. It has a club head angle that is in between those of its cousins the pitching and sand wedges. The gap wedge is a specialized club for the golfer who plays close to the green. A gap wedge's angle varies between 50 and 54 degrees. 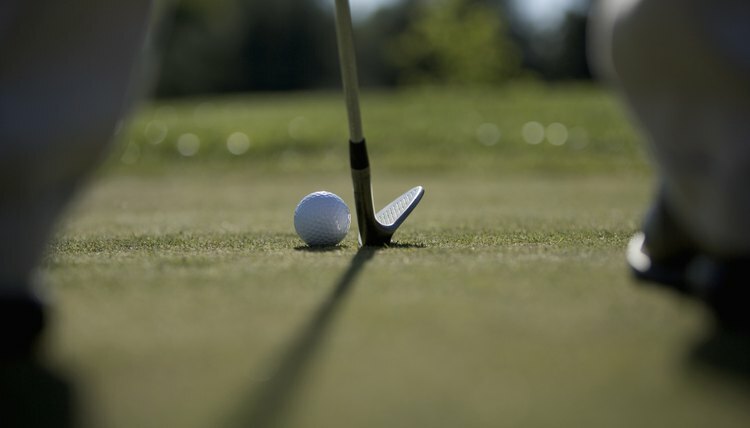 The pitching wedge is usually around 45 degrees while the sand wedge is between 54 and 58 degrees. Golf club makers have decreased pitching wedge loft degrees over recent years, with the gap wedge becoming an option for golfers. The gap wedge usually replaces one of the three other wedges (lob, sand, pitching), as many golfers only carry three wedges, including the tour professionals. Gap wedges are more commonly made of steel. Steel is more durable than its graphite counterpart, and a steel wedge can help to control the shot. Graphite gap wedges provide extra distance for a golfer while eliminating shock from the shot. The loft of the club determines distance. Many gap wedges can be hit 90 yards, less than the average pitching wedge shot, which is about 105 yards, but more than the average sand wedge (70 yards), according to Leaderboard.com. Distances may vary between golfers. You should practice hitting your sand and pitching wedges to determine the differences in distance. If you're comfortable with the distances with which you're hitting your wedges, you may not need a gap wedge. Bounce is the amount a club's leading edge is above the bottom of the club face. The club face bounce determines your ability to hit the ball through sand, grass, etc. Your gap wedge gives you a higher amount of bounce (6 degrees or more) that will help you hit off hard and dry fairways or soft fairways. A gap wedge should have the proper finish for the ball to gain spin. The appearances of a wedge may include chrome, dark and rusted. The darker face provide a softer feel and has a more textured finish that produces spin. When the gap wedge wears over time, the texture of the club face wears down and spin is reduced. You should clean your clubs regularly to maintain the finish of the club and produce the results you are looking for. What are the Differences in Golf Wedges?